MPF-J Series are conventionally wound cartridges. These cartridges are manufactured on precision winding machines to an engineered pattern to give accurate micron retention and progressive depth filtration. Tolerances on the single roving filter media are rigidly controlled to produce a quality cartridge with consistent filtration characteristics. Continuous wind pattern over full cartridge length means no joints or dead spots, no bypass and ensures uniform flow through the entire filter element. MPF-J series wound cartridges are available in a wide range of materials. The materials of construction (filter media and core) offer broad chemical and temperature compatibility. Chemicals — acids, alkalies, organic solvents, electroplating, photographic solution. Beverages — soft drinks, beer and spirits. Food Products — edible oils, cocoa butter and sugar syrups. Petrochemical — polyester resins, organic chemicals, sulfolane. Oil & Gas — lube oil, amines, glycols, Benfield solution, condensate, etc. Choice of over nine different filter medias and four different core materials. FDA, CFR 21 compliance material used for cotton and polypropylene media. Standard cartridge diameter of 2-/2", in 9-Y4" to 40" integral lengths. Provides consistent and repeatable filtration characteristics. Broad chemical and thermal compatibility. Able to withstand temperature up to 400 0C with fiber glass media. 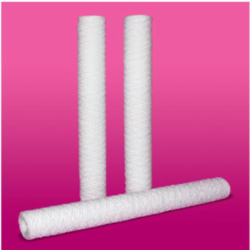 Looking for Glass Fiber wound Cartridge Filters ?